My last meaningful dive experience has been over a year ago. My spouse offers me the opportunity to spend a week diving what would essentially be redundant with what I had dove over 14 months back. Ordinarily, I’d balk. There are simply too many enchanting, fabulous places I have not ventured into throughout this adventurous world for me to make return engagements. 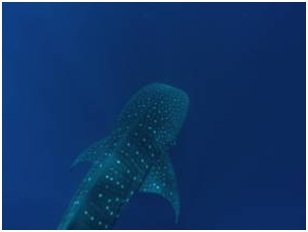 This is six days in world-class Roatan (I had been at nearby Utila last year). We arrive at Anthony’s Key Resort. We are greeted by helpful staff and gentle sea breezes. Air that is soothingly balmy — not too hot or too cold day or night. Swaying palm trees. Groomed sand. A simple, rustic cabin on a car-free island surrounded by bath-warm, crystalline waters and reefs. Nearby dolphins playfully leaping out of the water as if in a ballet. Picturesque sunrises and sunsets. Quiet, serene solitude. Loudly chirping tropical birds. A near absence of insects. A short walk to our breakfast/lunch/dinner restaurant. An ice machine 100 feet from our cabin. A cabin that does not have windows – only screens – as the temperature is lovely throughout the year. A bedroom so close to the gentle waves of a coral reef sea that we fall asleep each night to a calming, placid series of waves lapping underneath us (the cabin is elevated). Oh, and a cabin porch with hammocks that we use each day to relax next to glistening water. In case all of the rest is not enough. If the word “idyllic” was an actual place, Anthony’s Key Resort would be that place. Near our cabin is a sandy beach with colorful kayaks awaiting us. I cannot resist on my arrival to our cabin, and I am nearly immediately paddling my way across the small bay to greet the 15-20 playful, friendly bottlenose dolphins that are housed by the Roatan Institute of Marine Science, where they are regularly fed, receive health care, are scientifically studied, and put on shows for guests of the Institute and Resort. 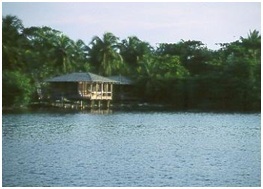 Anthony’s Key, where the resort is located, is a small island off the larger Roatan Island. It is a stereotypical tropical fantasy island. Finely-groomed sand walkways and a forest of sea grapes and coconut palm. 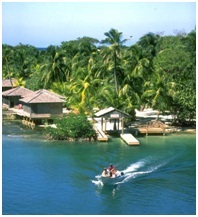 A 45-second water taxi runs 24/7 from the Key to Roatan and back. Anthony’s Key turns out to be just what the doctor ordered. Our first dive on this Sunday morning — our first day — is Gibson Bight reef. I am delighted to discover impressive crevasses, which I happily explore and soar through. 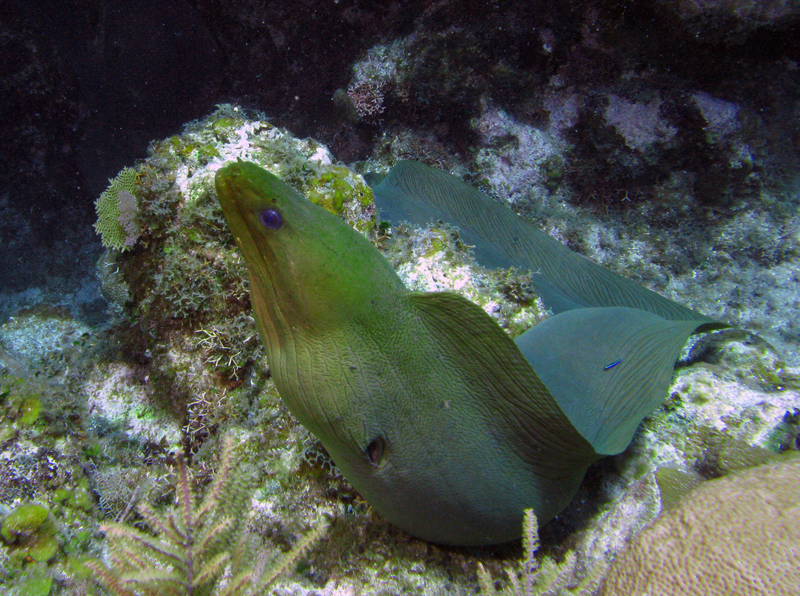 Along the way, we spot a big Moray eel. Later in the day, at sites such as Pillar Coral, we enjoy swim-throughs with a chimney, barrel coral, and overall healthy coral reefs. 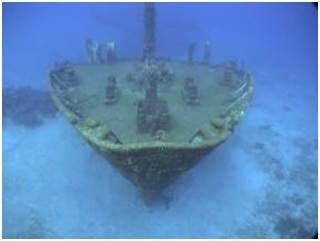 On our second day, we are treated to the Odyssey Wreck. At 110 feet down, I find myself swimming back and forth up a long, winding ship stairway, which was a bit disconcerting. While at the ship, we find Dogtooth Snapper and big Silverfish. Now that my previously misbehaving buoyancy compensator has been corrected by the dive shop, I am no longer wasting energy by fighting to stay at a level surface. No longer bobbing up and down (and beating up my poor ear drums due to changing water pressures), my comfort level has returned and I am blissfully, slowly floating in and out of the ship. Just in time. On many of our dives, we find ourselves beginning or ending our coral reef explorations within a cluster of enormous goliath grouper engaged in a feeding frenzy (to the point of swimming into us and through our legs, and sometimes following us for our entire 40-minute dive). Looking for treats from divers often happy to feed them fishy snacks. 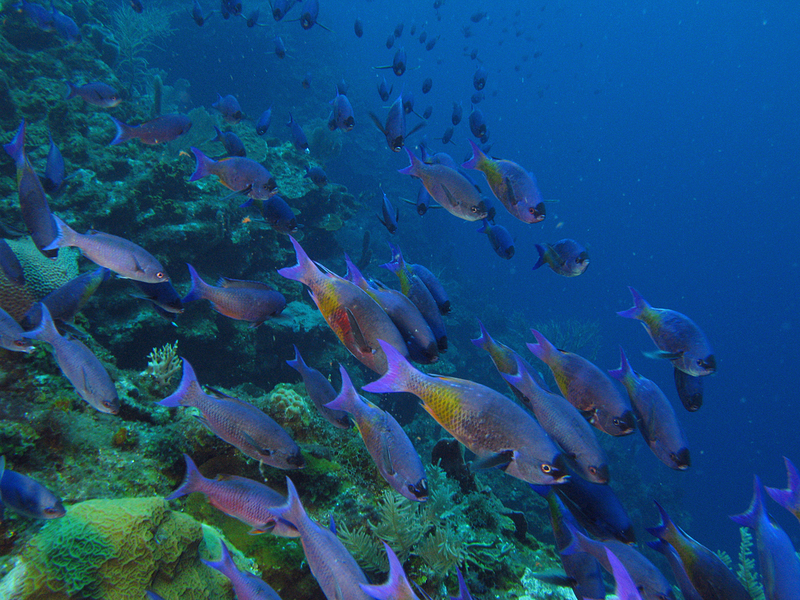 Other times, we often came upon large schools of iridescent blue fish. The 8-12 Resort dive boats lined up along the dock throughout the week mimics a line of buses poised to pulse out on their routes. The Resort is geared up for serious diving. On one afternoon, satiated by outstanding dives, we opt for the free horseback riding offered by the Resort. Unfortunately for Adrenalin-Junkie-Dom, my horse refuses to canter at all for the 30 minutes of riding out along the beach. I am at the rear of a line of several horseback riders, feeling like a little four-year old. Fortunately, though, my horse finds his enthusiasm on the ride back, as he canters happily and briskly on our return. Late that afternoon, we walk the short distance to the Marine Institute and watch an impressive “presentation” by the dolphins and their trainers. The trainers were torpedo’d at high speeds through the water by the happy dolphins pushing them from behind, and tossed into the air and onto the wooden platform deck where the trainers orchestrate the dolphins. Twice I engage in night dives, and am astonished to find large populations of lobsters (including a “slippery lobster”) with glowing eyes, and large king crab. In particular, I relish the night dive at Deep Eel Garden, which has deep, narrow crevasses. Crevasses which are delightfully creepy on a night dive. A diver is never quite sure, after all, what lurks around a dark, night-time corner in an underwater canyon. If a diver gets his hand bitten off by a Moray eel at night, does his scream make a sound? Of particular interest to me was Canyon Reef, which features an amazing number of long tunnel and canyon wall swim-throughs, which I mostly sample on my own, as the dive master oddly by-passes most of them. The reef also features unusually colorful coral, particularly on its top. On Thursday, the famed El Aguila Wreck is on our agenda. This is my second dive into El Aguila. The first was in 2007. This time, it is quite special. On the way down to my ultimate depth of 109 feet, I cleared my ears continuously to desperately ensure that they were equalized for the sharply increasing water pressure. All of the night before, I worried that my often troublesome ear-clearing problem while diving would prevent me from fully enjoying this famous wreck, and I do what I can to avoid the catastrophe of missing it. As I reach the ship, I am more than relieved that my strategy worked wonderfully. 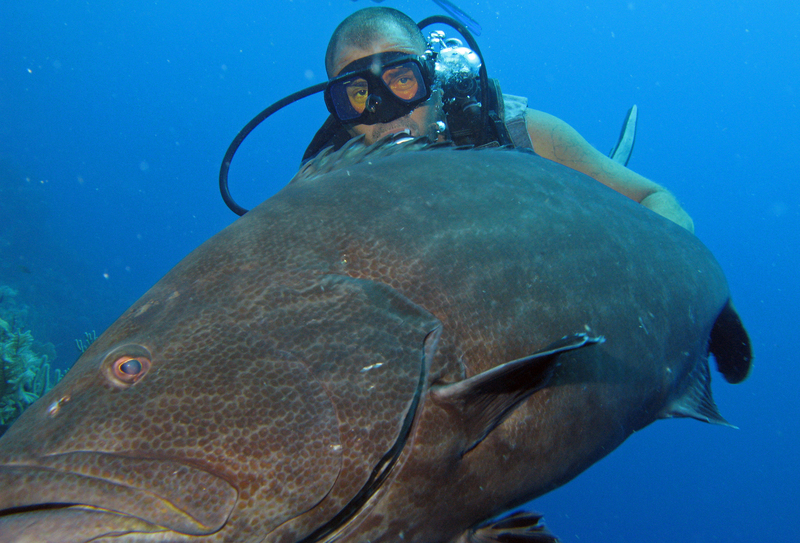 While at the Wreck, a huge grouper greets us, with the Wreck looming behind this giant fish. We are treated to three spectacular swim-through penetrations into the ship – one a long tunnel, another a long passageway twisting into a collection of rooms, and another leading us up a long stairway. On this last one, as we emerge through a small opening, we are greeted face-to-face by a large, jaw-dropping, and menacing green Moray eel, who is a few feet away from the opening and chomping his mouth as he sticks his head out of his own little metal tube home – just daring us to come closer. Immediately after I emerge from the ship, I shoe away a delicate and pretty shrimp fish at the exit, and we suddenly spot a lovely spotted eagle ray swimming gracefully with us. 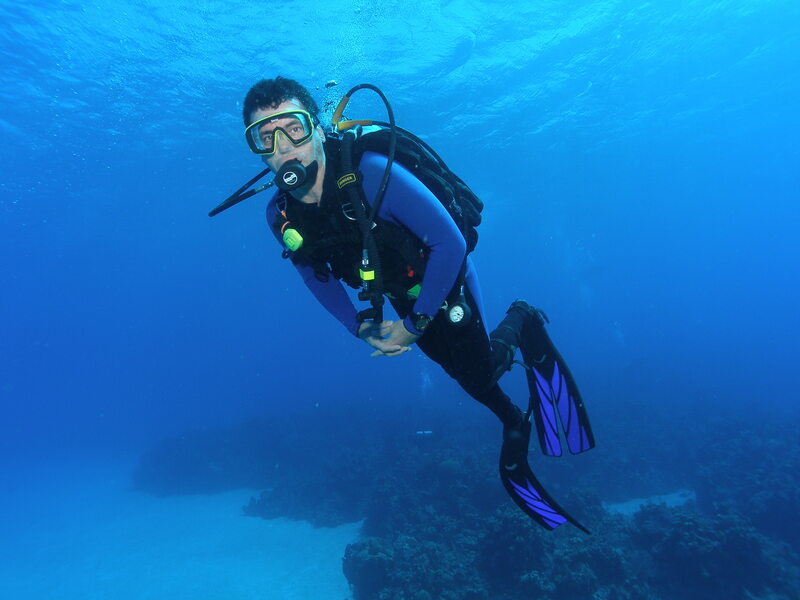 At the dive end, I experience what must be the most fantastic “safety stop” in all the world (divers usually need to stop at 15 feet for a few minutes to avoid “decompression sickness” – the “bends”). A narrow, seemingly endless coral-studded swim-through tunnel at 15 feet of depth. After a relaxing drift dive, our dive boat takes us on a rocking and rolling rollercoaster ride of rough seas to the south side of Roatan Island, where we are let off at a luxurious resort building with colorful landscaping. After enjoying a seafood lunch, we retire to a beach chair on a sparkling, gorgeous beach. Apparently, the only thing that keeps the beach from being rated one of the best in the world is that occasionally, a large jetliner flies over us at treetop level to a nearby airport. On the beach, we are serenaded by what is evidently a traditional Honduran folk band, dressed in traditional, colorful costumes and playing trunk drums, a seashell for a horn, and the unusual, wailing voices of Honduran women. Our afternoon dive is at Butcher’s Bank Reef. Here, I find myself swimming past what seems like a highly intriguing, mysterious cave tunnel. The dive master, happily, enters the tunnel. Mysteriously, he does not beckon the divers to join him. So I wait to see if he will emerge at the other end, rather than turning around and coming out. He doesn’t, but by now a large number of divers in my group have followed him in. So I enter – 2nd last in line. A dreadful mistake. The diver in front of me is tentative, slow and unsure. She seems to panic and exit a chimney that appears to be short of where the other divers in front of her had gone. I see a cloud of sand in the tunnel past her exit channel, so even though I cannot see other divers further into the tunnel, I assume they have gone that way and are just too far ahead to see. I risk going in deeper, therefore. On our last day, we dive “Spooky Channel.” It is indeed quite spooky. Huge, deep, white-sand-bottom chasms in a murky, milky, gloomy, seemingly bottomless depth. We end the day with a few diver diversions. First, a “dolphin encounter”, where we have 30 minutes of petting, stroking, getting a “kiss” from, and cradling a bottlenose dolphin that is so very happy and friendly to enjoy our attentions. Next, it is on to a Roatan rainforest canopy “zipline”, where we are rigged up with a harness and gloves, and cabled down 24 high-speed runs above and through the trees. It is my first-ever chance to experience this odd form of recreation. I liken it to a Honduran version of an amusement ride. Clearly, there are very few ambulance-chasing lawyers in Honduras, as this is a low-tech and surely precarious activity prone to mishap. Indeed, it occurs to me that if I were a 12-year old, I would have LOVED to have thought up the concept and rigged it up in the woodlands where I grew up back in upstate New York (where the danger is more along the lines of an angry woodchuck or cow, rather than a poisonous snake or tarantula). 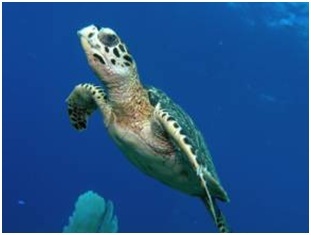 During our week of diving, we come across quite a few turtles and lobster (and even a golden sea horse or two). But I was disappointed by the notable absence of sharks (not just whale sharks, but even nurse sharks), barracuda, Moray eel, and rays. 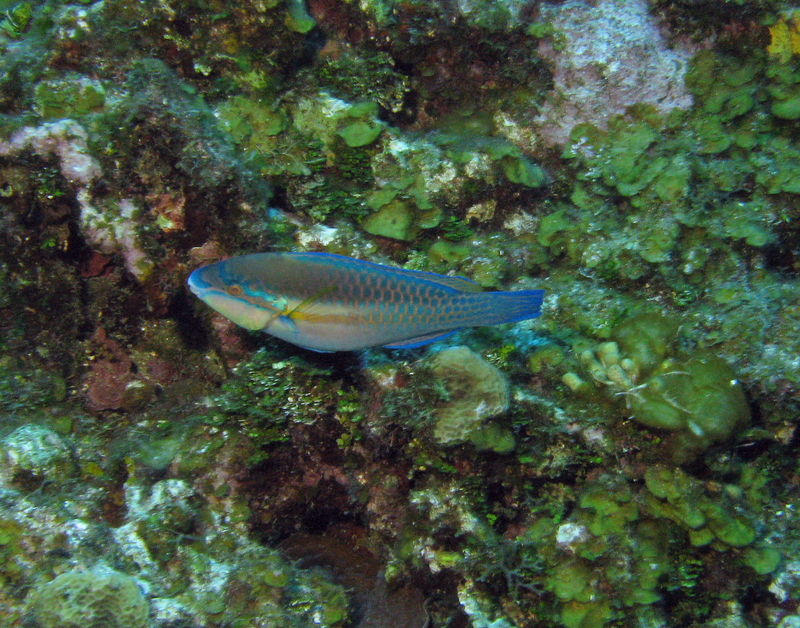 The reefs in Roatan remain healthy, but the larger marine life seems sparse. 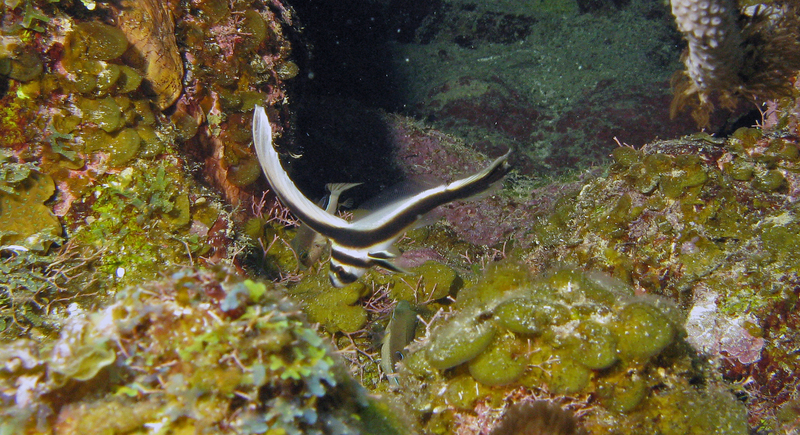 I should admit, though, that on more than one occasion, I found myself playfully chased by a healthy Moray eel or two. Overall, the diving was joyful. The wrecks are impressive, as are the entertaining swim-through crevasses and canyons. And the colorful reefs. Each day before or after diving, I would find myself calmly, unhurriedly walking to or from our cabin through a tropical coconut forest without a care in the world. The sand beneath my feet would be combed level as a pool table. The water taxi would be awaiting me, as if it was my own personal service, to ferry me across the water. 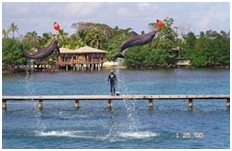 Anthony’s Key Resort is truly a tropical key diver’s paradise.